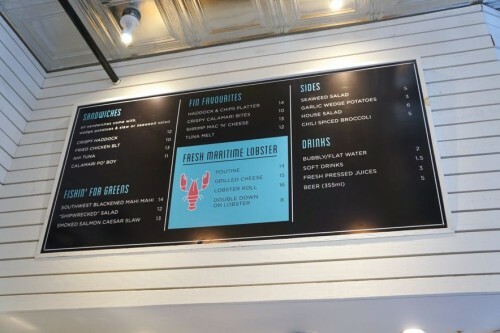 Located on the ground floor of the historic Dineen building on Temperance street, Little Fin (@Little_Fin) has been serving up satisfying seafood fare for just over a year. 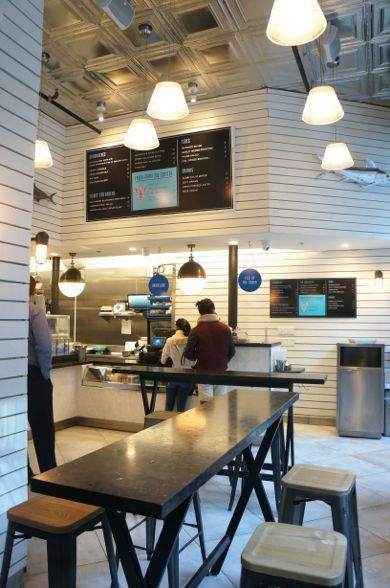 This modern quick-service seafood joint is part of the Chase Hospitality Group family which also owns The Chase (@TheChaseTO), The Chase Fish & Oyster (@thechasefo) and Colette (@ColetteToronto). Like all their other restaurants, Little Fin is beautifully decorated. With high ceilings, enormous windows and horizontal white paneling, the space feels very light and airy and definitely gives off a nautical vibe. There’s a lot more seating inside the restaurant than I expected. 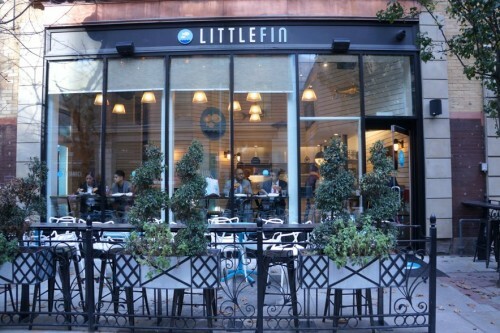 It’s even better in warmer months as Little Fin boasts quite the large patio out front. The interior features a narrow communal table as well as a ledge (dotted with seats) which wraps around the edge of the restaurant. Last week Mike and I was invited to try out their new menu items and when we dropped by around 12:15 for lunch, I was surprised at how busy it was for a Monday. They seem to be particularly popular with the take-out crowd. The entire time we were there, the kitchen was churning out take-out bags non-stop. They also offer catering which I’m sure would be a welcome change to the usual mystery sandwiches that get served at corporate lunch meetings. 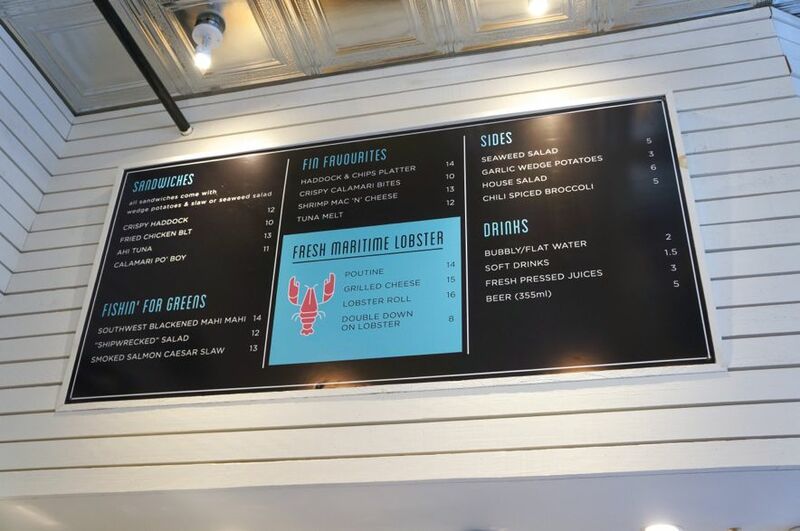 Little Fin’s menu is broken down into several sections: sandwiches (including a fried chicken BLT for the non-seafood eaters), salads, ‘Fin Favourites’ (like fish & chips and calamari) and fresh Maritime lobster dishes (which includes a tempting poutine and grilled cheese). I can guarantee you’ll have a difficult time narrowing down what to order! 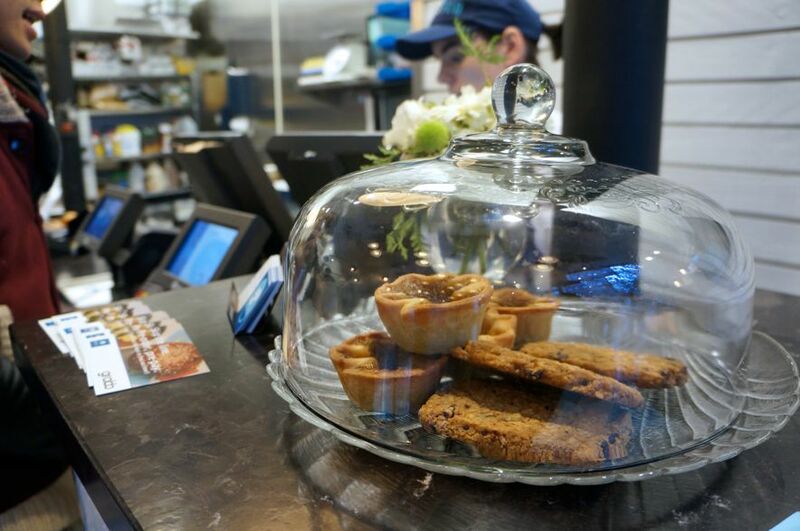 Oh, and make sure you save room for something sweet. They carry sweets like cookies and butter tarts from their sister café, Colette. Mike and I ordered a few things to share. 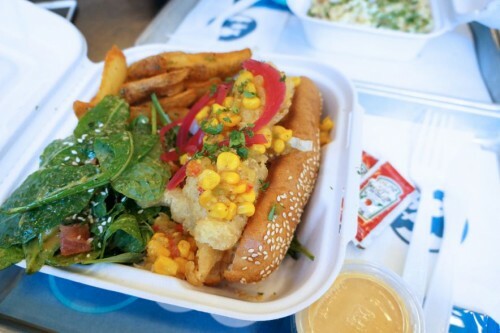 First up was the Calamari Po’Boy ($11), one of their most popular new menu items. One bite in and I instantly knew why this is so popular. I loved the light and crispy calamari batter. While the calamari was deep fried, it didn’t taste the least bit heavy. 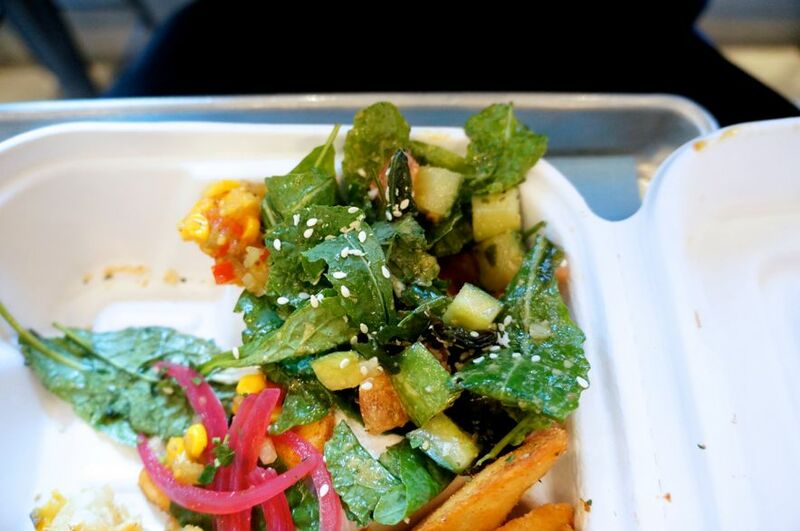 I also loved the addition of the corn and pickled onions on top. I have to admit, it’s a little difficult to eat but it’s worth the trouble! 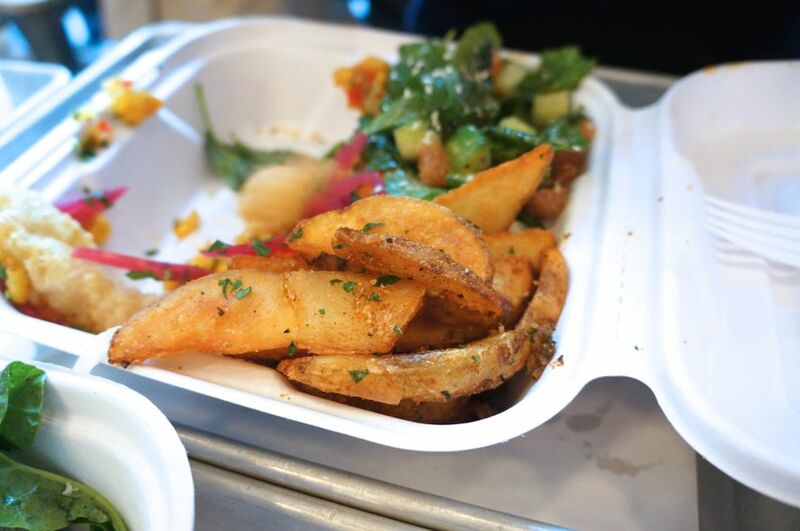 All sandwiches come with wedge potatoes and slaw or seaweed salad. Little Fin makes some killer wedges. They are extra crispy, seasoned deliciously (very garlicky!) and super addictive. Even if you’re not getting a sandwich, I recommend ordering a side of these. Between the slaw and seaweed salad, we opted for the latter since it sounded more interesting. The salad consisted of a mixture of greens and seaweed covered in a tasty Asian dressing. All in all, a nice side salad! Up next was the Tuna Melt ($12). This isn’t one of the lighter options here but at least it comes with a salad! 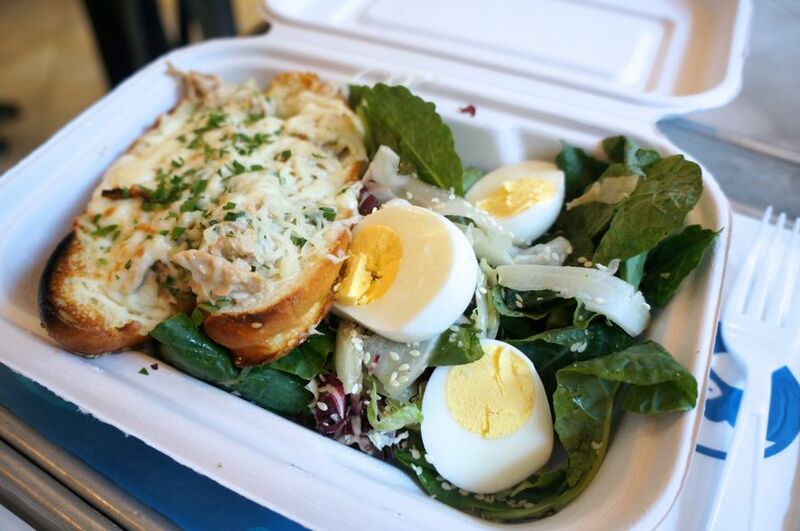 The sandwich certainly isn’t your average tuna melt. Super comforting and the side salad (reminiscent of a Nicoise salad) was a delicious accompaniment. 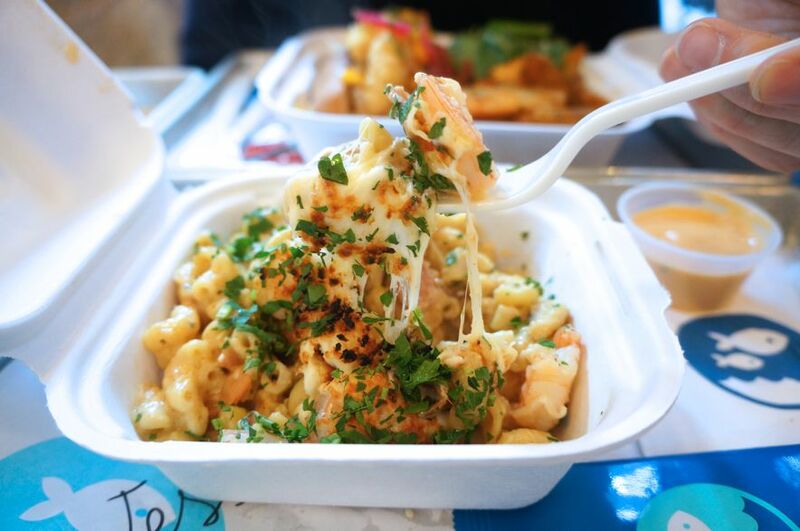 The last item we tried was the Shrimp Mac & Cheese ($13). While the portion size isn’t huge, it is quite rich and filling…and crazy delicious! The macaroni noodles and plump shrimp were covered in a generous amount of melted cheese. It was our favourite dish of the meal. Comfort food at its best! We had such a great lunch at Little Fin. I’m shocked this was our first time here but it certainly won’t be the last! Little Fin is open for lunch Monday to Saturday from 11am. Come by and get your hands on some of these delicious new menu items!